The joy of an annual wine show devoted to one of the world's most celebrated vinous regions is knowing you'll find your favourites every time. Every year, without fail, the California Wine Fair delivers. I can have my glass of Gloria Ferrer right off the bat. I can seek out Fleur de Californie's pinot noir rosé and walk around with a happy smile on my face. I can skip in giddy bliss knowing that Birichino's vin gris is a mere dozen feet away from where I'm standing. I can sample a dozen versions of the state's big hitters all in one room: cabernet sauvignon, pinot noir and chardonnay. Or I can take a stroll down the road less travelled and see what's new. This year, it was all about Italian varietals living the ex-pat life in the Golden State. Sangiovese, primitivo, barbera—either in a blend or stand-alone—popped up as I moved from table to table. The most impressive of the bunch was Uvaggio. That's Italian for 'cuvée', but it encompasses so much more terroir than the name suggests. Winemaker Jim Moore walked me through his line-up, each sample evoking a "did you know?" moment or anecdote he was eager to share. Like how giallo (golden muscat) is the most sophisticated of the muscats, how it is used mostly in dry wines, and how it looks like a mash-up of French's and Grey Poupon at harvest. The end result, a 2010 Moscato Secco from the Lodi region, reminded me of rosewater and refreshed the palate with crisp acidity. Speaking of Lodi, the more I taste from that region, the further I fall in love with it. It started with a Ravenswood Old Vines zin a few years ago; since then, very few wines from this special parcel of land have disappointed, or even come close to a let-down. Both of Michael David's zinfandels this year were spectacular: the '7 Deadly Zins' 2009 Zinfandel had a wild nose and matching flavours of roses, licorice, campfire BBQ smoke and spice box. Drink now, repent later. (Bonus: you can get it at the LCBO! VINTAGES 59311 $24.95) I've tried David's 'Earthquake' as well; the 2010 was just as memorable, with a muscular presence, peppery mouthfeel and long, jammy finish. 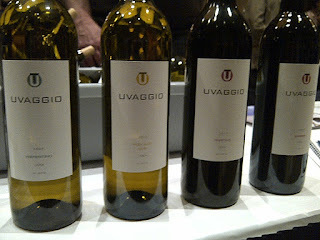 Uvaggio 2010 Primitivo (Lodi) - This is Italy's zinfandel, hailing all the way from Puglia. Well-crafted, with restrained fruit and solid structure. The fruit is big without being sweet. Honig Vineyard 2011 Sauvignon Blanc (Napa) - From a passionately ABC (Anything But Chardonnay) winery comes a New Zealand-style s.blanc that won best in show in its first vintage at Napa's foremost wine festival. Grassy and sweet, classic character, with more of a floral nose and edgier complexity. Rutherford 'Round Hill' 2010 Oak-Free Chardonnay - This is not your standard California chard. Aromas of straw and fresh-cut grass up front, then mounds of tropical fruit on the follow-through. Firm acidity leads to a lively finish. Rutherford Ranch 'Rhiannon' 2010 Proprietary Red Blend - Syrah, zinfandel and barbera come together to make a plush, soft and well-balanced experience for the senses. Schug Carneros Estate 2009 Pinot Noir - Thick, rich red berry, earthy mushroom, lush mouthfeel and lingering floral notes on the finish.